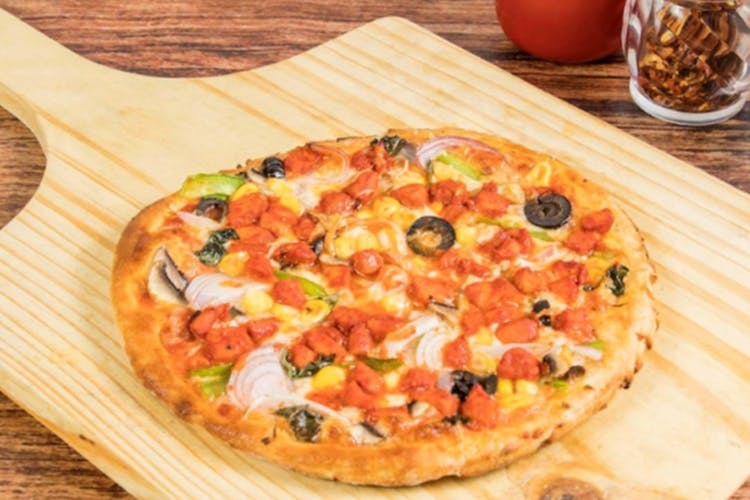 A personal wood-fired eight-inch pizza is what Flame Pizza in Yelahanka does best. Throw in a mom to fuss over you, pocket-friendly menu, and wood-fired garlic bread, it’s the perfect neighbourhood hang! Artisanal hand-tossed, wood-fired pizzas are few in Yelahanka or at least that’s what we hear. But the folks behind Flame Pizzas are here to change that and they throw in the menu that can be decided by you! Personal, custom, call it whatever, the eight-inch pizzas are made to order. Choose from two types of crust — white Italian and brown wheat — to start with before choosing either red, white or an Indian sauce for your pizza. There’s only chicken or paneer as the main toppings but you get Peri-Peri and Smoked Barbeque flavours along with 13 other toppings to finish off your pizza. Oh, we almost forgot about the cheese. For extra charges, you can opt for bocconcini mozzarella instead of regular mozzarella. Each pizza roughly takes about eight minutes to bake, so while you wait for that, order a round of garlic bread that comes with corn and green chilli toppings! They do regular garlic bread too! The eight-inch pizzas work for any who likes the idea of having an entire pizza to themselves. A mix of community tables, high-rise tables with bar stools, and regular seating give off those neighbourhood pizzeria feelings where you can take your mum to or hang out with your squad. The whole space is managed by the owner and his mum, and they will be around telling you what combinations work best or simply to ensure that you have a good time.